100 Miles (160km) – ENTRIES ARE LIMITED. No late entries will be accepted. Four spectator points – go and support the riders! Maps on the route page. The Amarider 100 Miler is an official Amarider event and is open firstly to Amarider members. Amarider members & Tag holders enter at a discounted entry fee. If you choose to join Amarider you will receive a permanent Trail Tag with your membership at R225 valid for 12 months. All income derived from memberships (donations or memberships) go towards the Amarider trail advocacy efforts. The Trail Tags are available for purchase at R100 or for rent at R50. You’ll use the Tag at most Dirtopia and Amarider events and many trails from this year so you might as well purchase one. If you don’t have a Trail Tag you MUST purchase a temporary Trail Tag at R50 OR a permanent Trail Tag at R100 upon entering. For the not so brave we have the 50 Miler (80km) which starts at Riebeeck Kasteel (Delico Butchery) and finishes in Malmesbury (please note entries are limited and only pre-entries are taken). Total route elevation is 1461m. There will be a shuttle from the finish to the start at Delico at 07h30 and there will be NO shuttle available in the afternoon. Please arrange lifts with your family or friends. It is a 25km drive from the finish to the start. Shuttle: Mail Alanda to to secure your spot, R180 – alanda@dirtopia.co.za. Please note no refunds will be made for shuttle bookings (even if alternative transport has been made). Please note in order to qualify for category prizes there must be more than 10 entrants within that specific category and must have crossed the finish line by the time prize giving takes place. 07h30 Shuttle leave from Malmesburg Showgrounds to start of 50 Miler (Delico). NO substitutions OR changes will be allowed on event day (Saturday, 19 May)! Remember you are ultimately responsible for your own nutrition, but but there will be breakfast & lunch stops with food plus snacks & drinks at the refreshment stations. Please note there will be a Lube Station at the mid-way point. There will be no official mechanical back-up on the route, so carry your tools or have your support crew meet you at the next allowed waterpoint. 2) Wear the tag around your right wrist like a watch. Not around your ankle please. 3) The reader is powerful enough to read through arm warmers etc. 5) At the TAG POINT you simply bring the tag in proximityof the reader at which point the reader will activate a loud buzzer to confirm that the read has been successful. It’s simple! 7) Similarly, when you cross the finish line you will do the same. 8) Note: Your Race Finish time will be measured on your Finish Tag Time, not when you crossed the line. There will be food, dinks & coffee at the start/finish area for sale as well. 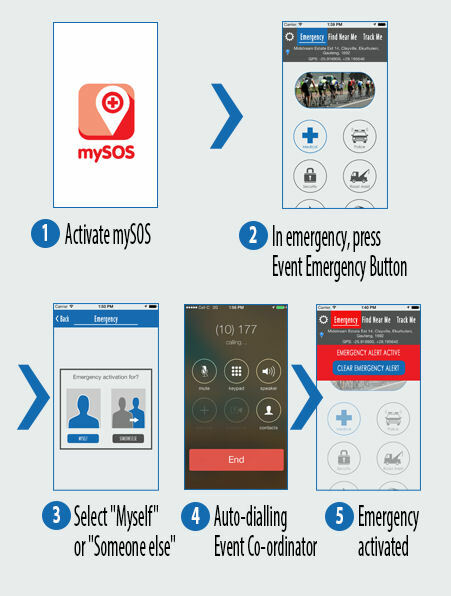 (d) auto-notifies the events emergency coordinator on your behalf and provides them with the necessary information.For more information:Twitter: @mySOSzaFacebook: https://www.facebook.com /mysos.co.zaWebsite: http://mysos.co.za/We encourage all participants to carry their phones with them during the event, arm pouches or a camelback will be perfect for this! Can also be purchased at our Trail Centre.